We’ve all heard, and have maybe used ourselves, the old saying, “I like (fill in a food item here), but it sure doesn’t like me.” Typically, that comment is prompted by the occurrence of a digestive malady — bloating, burping, gas, and especially heartburn. Spicy foods, onions, tomato-based foods, fatty foods are common culprits for the discomfort. For those every-so-often instances of heartburn, aptly named for its presentation as a burning pain in the chest, most people can find relief in an over-the-counter tablet or chewable. For others, heartburn becomes a chronic condition requiring medical attention. By this point, the issue has often progressed into a disease state known as GERD (Gastroesophageal Reflux Disease). In addition to heartburn, symptoms could include regurgitation, chest pain, night coughing, even a persistent sore throat. Dr. Sidney Rohrscheib, a Board Certified General Surgeon and founder of Illinois Bariatric Center explains that GERD is the failure of a one-way passage created by a muscle called the Lower Esophageal Sphincter (LES). This muscle, located at the bottom of the esophagus, allows food to pass into the stomach. The muscle relaxes when a person swallows, allowing the food to pass into the stomach, and then closes snugly to keep the food in the stomach. Additionally, it keeps the stomach acid that begins the digestive process of breaking food down from traveling back up the esophagus. A normal, functioning lower esophageal sphincter also expands when a person needs to burp or vomit. 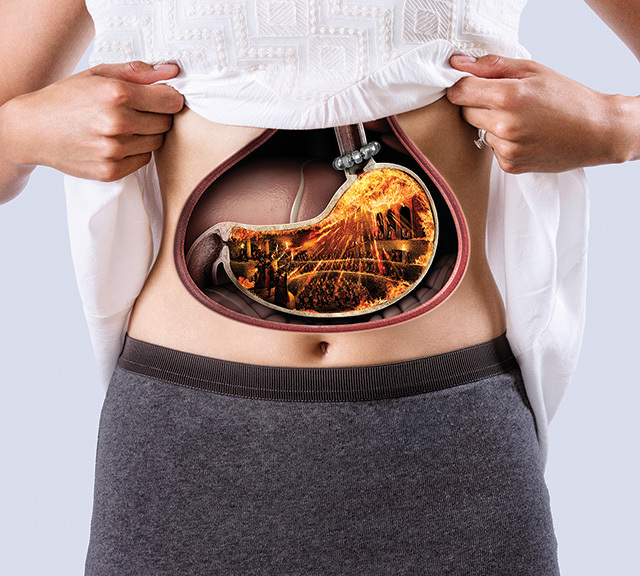 Reflux and GERD, heartburn in general, is caused when this sphincter no longer closes properly and the acid and bile in the stomach is regurgitated back up the esophagus. Acid, being acid, causes the burning discomfort and, over time, causes damage to the lining of the esophagus, throat, and lungs. 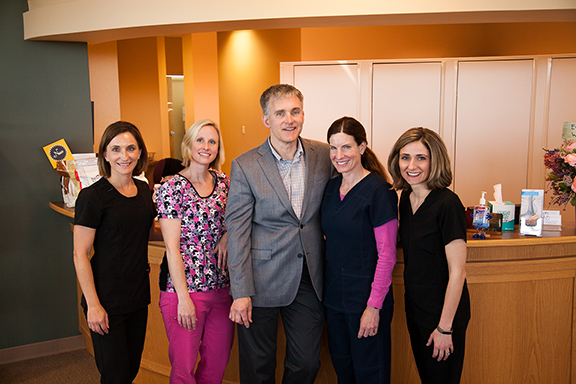 Thirty years ago, according to Dr. Rohrscheib, GERD was almost always treated surgically. Patients with persistent and chronic heartburn symptoms would undergo a procedure called the Nissen fundoplication. This surgery used the patient’s own tissue — namely the top of the stomach (fundus) —to strengthen the closing function of lower esophageal sphincter. The stomach tissue was wrapped around the bottom of the esophagus and sewn into place to create a small tunnel through which the lower part of the esophagus could pass into the stomach. This repair helped stop acid from traveling back up the esophagus — effectively stopping the incidence of heartburn. 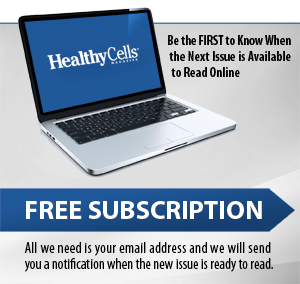 For many patients, this worked well — at least for a period of time. Some found that the surgery wasn’t durable and didn’t last more than a few years. Others had problems because food could pass into the stomach, but they were unable to burp or vomit when they needed to, causing severe pain and discomfort. This result occurred because the tissue used in the Nissen fundoplication procedure was not designed to expand and contract exactly like the lower esophageal sphincter — it was truly a one-way path. Still, the Nissen fundoplication surgery was a good option to treat chronic heartburn and acid reflux until 1995 to 2000. During this period, a marked decrease in the number of surgeries took place, largely due to the introduction of prescription medication that decreased acid production in the stomach. With the introduction of these drugs, patients stopped seeing surgeons and instead went to their primary care physician or a gastroenterologist, who would prescribe a drug (proton pump inhibitor) and the heartburn would go away. “The trouble with proton pump inhibitors is that they provide palliative relief,” says Dr. Rohrscheib. That means they really aren’t curing or solving the acid reflux problem, they are hiding or alleviating the pain — the burn — associated with heartburn. Additionally, we are now discovering other issues caused, or masked, by long-term prescription (and over-the-counter, as many of these drugs are now available at your local drug store) use of PPIs. In fact, the labels on the drugs themselves state that they should be taken no longer than six to eight weeks. At the end of that time period, the patient should be weaned off the drug. If acid reflux and heartburn recur, they should be referred for definitive treatment (e.g., surgical correction to the mechanical dysfunction of the lower esophageal sphincter). One of the most distressing issues that has arisen over this time period is the increase in esophageal cancer. Odd, since the proton pump inhibitors decrease the amount of acid. Unfortunately, the acid is not what is carcinogenic — but the acid would have caused a burn, which would have prompted a visit to a physician, who could have discovered the cancer much earlier. No acid, no burn, no trip to the doctor to find out why the heartburn won’t go away, with a resultant increase in cancer over the past several years. Other consequences of long-term PPI use include osteoporosis. We need acid to help with calcium absorption. PPIs decrease the amount of acid, less acid means less calcium absorbed into bones, and ultimately our bone health is adversely affected. Kidney (renal) failure has also been linked to extended PPI use. What’s becoming clear is that long-term use of PPIs for heartburn and acid reflux treatment is not the best strategy. But, what is a strategy that will work? 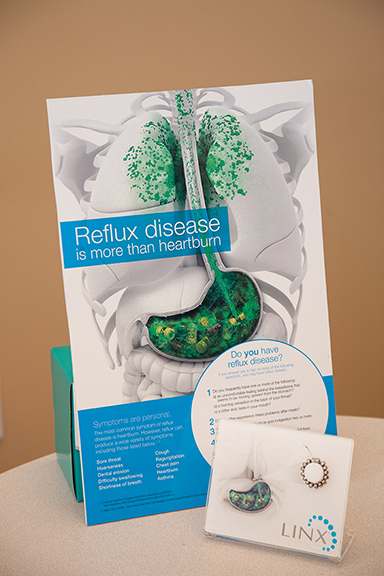 A relatively new device solves many, if not most, of the heartburn and acid reflux issues patients face. 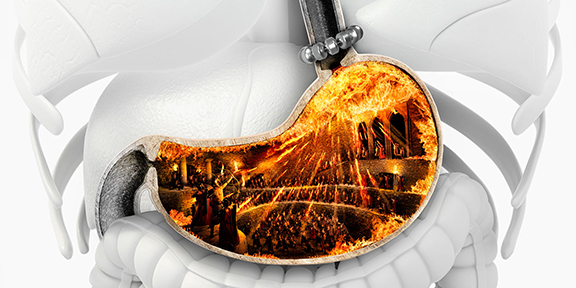 The LINX Management System, generically called magnetic sphincter augmentation, can help patients with GERD feel better, without masking pain with on-going medication use or altering the acid content of the stomach. LINX is a small, flexible ring of magnets, generally about the size of a quarter, that imitates the true function of the lower esophageal sphincter. It opens to allow food into the stomach, then closes to prevent the contents of the stomach from coming back up. Inserted through minimally invasive laparoscopic surgery, the LINX device does not require any anatomical alteration or disruptive intervention. The biggest benefit to this, when compared to the Nissen fundoplication, is that belching and vomiting are not impeded. Though rarely necessary, it can be removed easily as well. Although LINX is inserted through surgical methods, it is outpatient, requiring only one to two days off work to recover, and with a much lower likelihood of other surgical side effects. LINX allows patients to get off and stay off medication because their heartburn, regurgitation, and bloating are eliminated. In fact, LINX offers dietary liberation compared with the Nissen fundoplication procedure, as some foods were restricted for those patients who had undergone a Nissen procedure. Dr. Rohrscheib describes candidates for the LINX device as those whose reflux is not controlled by medication and is causing pre-cancerous changes in the esophagus. In addition, those who have chronic heartburn and acid reflux that is controlled by medication but want to get off the medication for the long term would also benefit from the LINX Management System. “If you have heartburn, try medication for six to eight weeks, per the label’s instructions. If it goes away and doesn’t come back, you may be okay. 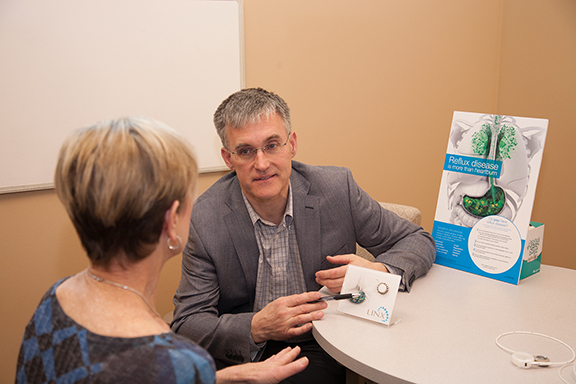 But if you are on medication and your symptoms persist, or they recur after you’ve gone off medication, LINX can be a huge benefit for you,” says Dr. Rohrschieb.